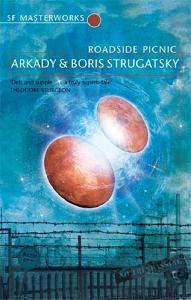 Russian science-fiction with a literary bent. Hmm. More like 'Russian science-fiction with an annoying bent.' As with a lot of sci-fi, the ideas are really interesting ... but the story ain't. Years before Roadside Picnic begins, aliens arrived on earth, hung about for a while, then nicked off. There was no contact between humanity and the aliens while they were here, but when they went, they left behind them a bunch of mysterious debris of dangerously advanced technologies. The Zone, where they were encamped, has been quarantined by the government to allow for study. But the black market in alien artefacts leads a reckless band of so-called 'stalkers' to make illicit trips into the Zone, hunting for goodies. Red Schuhart, drunken bum and gifted stalker, makes various trips into the Zone, at the urging of crooks, scientists, and government functionaries. So far, so good. Some of the best writing in the book is saved for Red's trips into the Zone, and the bizarre and fantastical conditions that are at play there. Red must read the air and the light, because even the slightest disturbance could herald the coming of something terrible, and deadly. During those (genuinely tense) scenes in which Red slowly, carefully, picks the meat from the bones, the novel really works. Unfortunately, once the Strugatskys enter the realms of character, emotion and motivation, they are obviously much less comfortable ... and much less skilful. The plot, such as it is in a book as slender as this one (144 pages), is a disjointed, rambling mess. As a reader, you're never allowed to know why people are acting the way they are, or why they feel the way they do. Characters are introduced, then dropped and never seen again. The protagonist changes for a chapter, to no apparent purpose, then changes back. The Zone suddenly develops new abilities halfway through the book, which pass unremarked. It's all a hopeless muddle. A book as small and as disappointing as this one doesn't leave a whole lot for me to say, I'm afraid. Oh well. Ouch! Definitely a come down from Cat's Eye then by the sounds of things! And the premise of the Zone sounds a little District 9-ish... which isn't a bad thing. Good luck with the Tolstoy - how many books to read til the next purchase? The story you describe sounds -very- similar to a film by Andrei Tarkovsky called (funnily enough) 'Stalker', about a few Russian guys that go into a forbidden 'zone'. The film goes for over three hours, check out youtube. Yeah, 'Stalker' is based on Roadside Picnic. I haven't seen any Tarkovsky films, I definitely need to check him out.